Oh Lordy. So, I’m back in that place where I always seem to find myself these days, trying to write a review months and months after everyone else has read the thing and (almost) everyone has loved it and articulated their feelings about it much better than I think I can (I refer the jury to Carl’s review as exhibit number one). 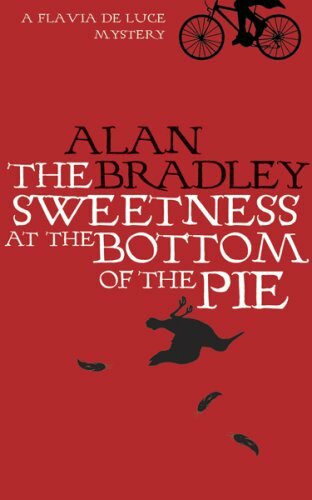 Your view of The Sweetness at the Bottom of the Pie is I think going to depend on how you feel about Flavia de Luce, heroine and amateur sleuth, 11 years old and plunged into a murder investigation when the body of a man who may or may not be known to her father is found in the cucumber patch. Given that Flavia’s mother died when she was very young, her father is her only family apart from her two fairly odious sisters, so she naturally sets out to get to the bottom of the whole thing. We are in 1950’s England, recovering from the Second World War, and Flavia is part of a family fallen on hard times and living in a mansion that has seen better days. She has a remarkable chemistry lab which sounds fabulous (even though I don’t do smells), her father is obsessed with his stamp collection (can understand that, I drool over my own occasionally) and their household staff are pretty odd but very loyal. The plot is irrelevant in lots of ways, though it is fairly enjoyable and although I suspect there are several plot holes I quite happily went along with it all simply because, precocious and faintly unbelievable though she may be, I really liked Flavia. Like my other read-a-thon books this probably benefitted from being read in a sitting (more or less) and it certainly got me through to the wee small hours. Looking forward to the sequel which is probably out already but I’m saving for later in the year.